Working with the exhibit design/build house EWI Worldwide, we were contracted to create a complex video interactive system that showcased manufacturer Dana Corporation’s wide range of automotive parts. The venue for the first installation of the exhibit was the worldwide showcase of the Automesse in Frankfurt, Germany. 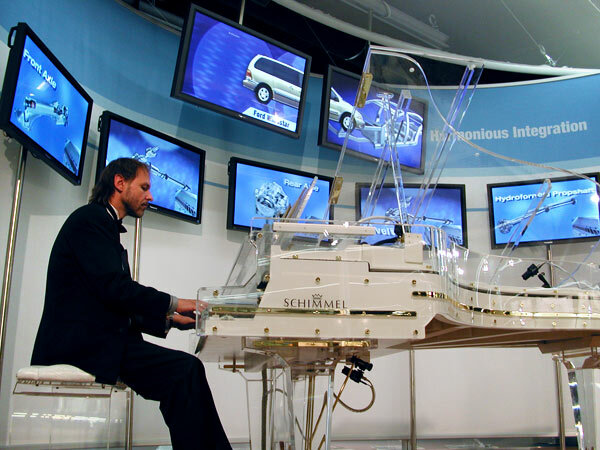 The main premise of the exhibit was the automobile was similar to a grand piano, with five major aspects of the auto; the chassis, engine, powertrain, suspension and architecture, mirrored by five in the piano; the frame, keyboard, strings, pedals and harp. We created a seven monitor display with vehicle parts from the five families slide across the monitors, while a show-controlled switcher changed camera sources on the piano to show the corresponding piano part in a video window. In addition to the multi-monitor display, we created and installed a series of five interactive touchscreen kiosks that provided the visitors to the exhibit a more in-depth look at the wide range of products offered by Dana.